White Chapel is a damn fine Gin-Bar nearby Union Square and Market Street in San Francisco. I hardly ever write blog-posts about bars, however if i'm writing a review about it, it's pretty obvious that i had a splendid time and a great night at the café. The walk from Union Square towards White Chapel will lead you through sketchy corners at night, but it definitely was worth the adventure. Passing by the bar, you hardly recognize it as a gin bar from the outside. After getting the head nod from the bouncer I walked in, as soon as i passed the door I exhaled an inner-wow. The interior design was astonishing! It reminded me of the shapes and forms of a cathedral, so did the low dimmed ambient light. I took a seat on at the bar and waited for ordering my first drink. While traveling solo, the first order often gives me a weird insecure feeling, because most of the customers are in groups or couples. The bartender Keli, who considered herself as a "ginoisseur", took care of my first gin&tonic made out of "Brooklyn Gin". To make me even more insecure she asked if i ordered a "brooklyn" or "brockley"gin. Because of the ambient noise I didn't understand what she was talking about. So she showed me both bottles and I picked the right one. Instantly I was amazed by Keli's knowledge about gin. After having downed my first drink, another unknown bartender, asked me for another gin&tonic. I agreed, and he filled up a glass with a homemade g&t from the tap. Gin&Tonic from a tap? That was weird and that's how it tasted, weird. I couldn't drink it. So I called Keli and asked her for another drink. She noticed that I didn't like the tap g&t. I opted for an icelandic gin. Kelli told me it's on the house. Considering that most gin&tonics were around 10-14$ , i found it pretty nice to get a free drink. After that drink Keli taught me lots about gin, and we talked about her travels, her experiences with foreign gins, etc. It was crazy to see how the gin scene had evolved since my last visit in San Francisco. Later in the evening I got in touch with Andrew and Enoch, two damn talented bartenders, who impressed me quite a lot with their mixing skills. When Andrew added me on instagram, we found out that we had lots of common interests, coffee, music and photography. I was invited to have a coffee at Andrew's place the next day. The roller coaster ride went on and I got served more gin&tonics, port wines, and cocktails. It actually was mind blowing to see how much effort and details Andrew and Enoch put into each cocktail they were pouring out. It looked and felt very artistic. I had quite a few tastings of several gins. I left the bar pretty wasted, but i was really happy that i ran into these people. Actually it was the first time where I had fun at a bar, only because of the staff working at the bar. I wish I had met more locals like Keli and Andrew in San Francisco. Genuine people! The cherry on top, was the music that night, all soul music! White Chapel thank you for having me! I just came back home from my 6th trip to San Francisco, and thought I'd get bored of publishing another blog-post about one of my very favorite U.S. cities, but that ain't the case. Once again I soaked up many new impressions and travel memories in San Francisco. Just before my trip, I put a list together with all the interesting parts & sights I hadn't discovered yet. I pretty well filled up the schedule of my 6 days and planned ahead which parts I'd visit on the specific weekdays. As my trip came to an end, I sadly realized that I still missed so many things, and that I barely completed my check-list. There's still so much to discover in San Francisco, even after 6 trips to the city. This time I really put my focus on its beaches. 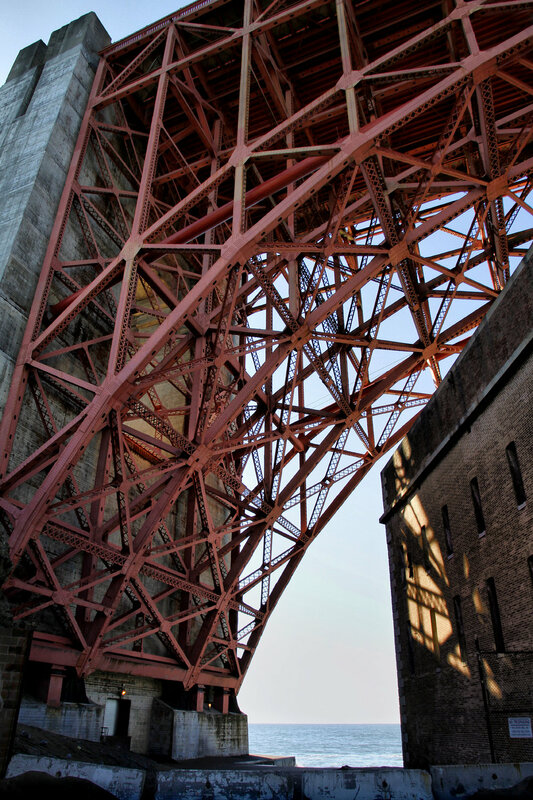 I was browsing through a couple of photos of the golden gate bridge, which were taken from the Baker Beach angle. I kind of felt ashamed that I never made it to Baker Beach, because you definitely get the best photos from that viewpoint. The typical tourist photos you see from right in front of one of both ends of the bridge, are the least impressive in my opinion. So I was looking forward to get to Baker Beach. As I don't like taking bus-rides in big cities, I decided to start my "baker beach hike" early in the morning at 6am, just before the sunrise, to get a couple of descent photos of the city, just before sun rise. I walked from the union square neighbourhood toward the ferry building very next to the bay bridge, that leads to Oakland. I haven't even been close to the ferry building, on my previous trips, and I felt like i missed a beautiful spot of the city. You can watch the sun rise on the pretty wooden pier, walking through the middle of the lamp-post lane. The cupid-arch is withing walking distance as well. Inside the ferry building you'll find lovely shops selling different kinds of crafts, "french" pastries, delicious coffee at "Blue Bottle". I tried to avoid the popular pier 39, which only has tasteless tourist-shop to offer, and almost only restaurants which serve bad and greasy food. From the ferry building, I walked up too many stairs til I reach the beautiful Coit-Tower. It became one of my favorite parts of the city, even though it attracts a lot of tourists. The altitude of the hill gives beautiful views all over the different areas of the city. I moved forward through the colorful North Beach, towards the "Ghirardelli Square" at North Point Street, where I stopped for my second coffee in the city. I was impressed how good their chocolate was. Who ever thought Americans were great at making chocolate ? ;) Outside of the Ghirardelli square, you already can witness the beauty of the famous red bridge, and it feels like it's already pretty close, but it's not! It takes another 40-50 minutes to reach it. After I made it to the bridge, I decided to move on to Baker Beach. 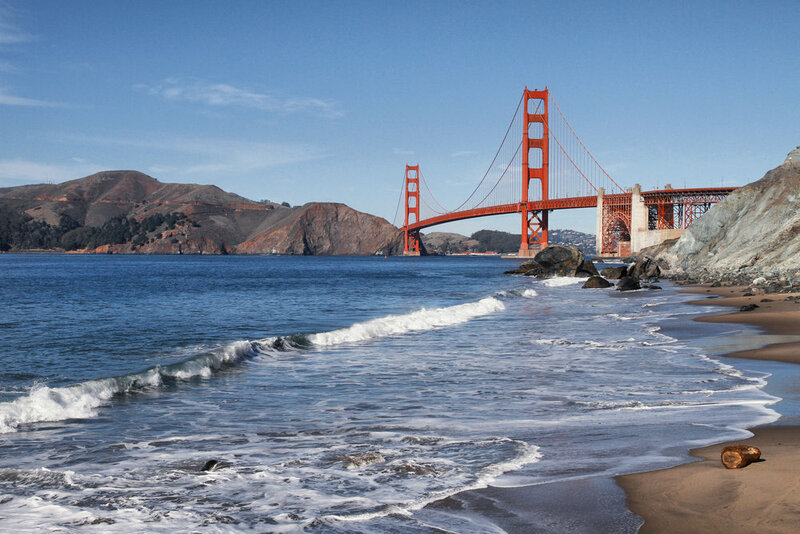 Starting from the Golden Gate Bridge, you can choose different trails that will lead you to Baker beach. To get to the trails, you gotta follow the path below the bridge, as I can remember it's the only way to get to the other side without a car. You walk past several view points and it felt like forever to reach Baker Beach. I took my first photo shots down at Marshall Beach. There are a couple of paths that lead you down to the shore, but don't forget, that you gotta walk those paths uphill again to move on towards Baker Beach. On my way a couple of tourists asked me if I had seen restaurants nearby, but I didn't. I guess those folks, underestimated the distance of the trails, like I did. And of course, it felt like summer! The weather was just great for a november, real t-shirt and shorts weather. I caught a light sunburn, walking all day in the sun. - it's further and more exhausting than I thought it would be. - it's only a small part of the San Francisco shores. - once you've made it to the beach, you gotta get back to the city. If you don't have the exact change for the bus ride, can't get a cab in the area, "uber" doesn't work, because you don't have internet-access on your mobile phone because of roaming issues, it's gonna be a hell of walk to walk back in the city center. Ocean Beach & Sutro Beach. On my second day, I decided to get back to the beach area. Walking down Powell Street towards Market Street, I took the "#5R-Fulton Rapid" busline, which was only 2.25$ . It takes approximately 35-45 minutes to reach the last bus stop of the route. From the bus stop it only takes a short walk to reach the beach, or to get to the wind mill that is located at the "Golden Gate Park". Nearby there's a beach house, where I stopped by for coffee & breakfast. It was kind of pricey, but you could enjoy an ocean view while having breakfast. North of the beach there's the popular camera obscura and the famous "Cliffhouse Restaurant". Behind the restaurant, there were several pathes which lead to Sutro Beach, where only ruins of the once public swimming pool are left. Following the different paths will lead you northbound towards Baker Beach, but it's still quite a few miles away. 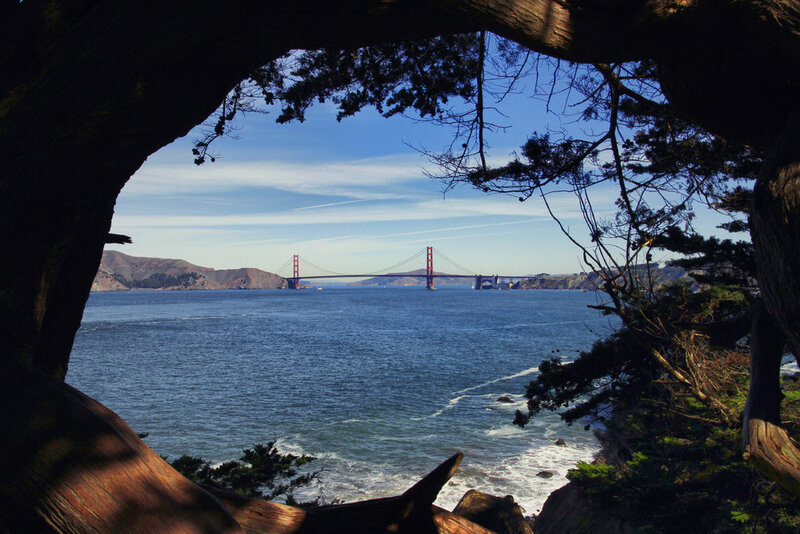 Nearby Sutro Beach, there's another vista point, which will give you a lovely view onto the Golden Gate Bridge. Besides the view, there's another big circle made out of stone to discover. It's really not a must-see, but while being in the area, why not check it out. Before heading back to the busstop, to get back to the hostel, I enjoyed some time on the beach, watching the waves collapse in front of me. The weather was just outstanding for a november. There aren't many cities that would come to mind, if i had to recommend a travel destination for the last two months of the year, except for asian countries or southern american countries. San Francisco would be one of the cities I'd consider turning back to in november or december months. Afer visiting an art gallery which hosted a couple of artworks of Shepard Fairey (OBEY), I was told that Fairey recently painted two new murals in San Francisco. The one I really wanted to see, was a mural of Cesar Chavez, which was located at Hayes Street, nearby the Patricia's Green square. I can't remember if i'd ever been to Hayes Street, but I was so impressed by the charm of that lovely and colorful neighborhood. The hood was packed with different coffee bars, art galleries, craft-shops... Once I'll get back to San Francisco, this is definitely gonna be the place where I'd love to hangout or even book a room at a hostel or hotel in that part of the city. More to come about this fabulous place. I will write a separate review about my favorite bar in town. The link to the review will be added soon. Clement Street (and 5th Avenue). I had my best night at Clement Street (with 5th avenue). I met up with my friend Jessica on a Saturday at Haight Street for a coffee. She decided to take me out the same evening to a show at the venue called "Neck of the Woods". The whole alley on Clement Street was packed with different restaurants, bars, bakeries, flower shops. Somehow it felt totally different than the other areas I've been to in San Francisco. It had the vibe of a little american village. There weren't barely any tourists, and it definitely felt like a local spot. People were a lot more outgoing and easy to talk to. I realized again, that the city has so much more to offer than just the popular spots. Even after my 6th visit in the "City By The Bay" there's still so much left to discover. San Francisco remains one my favorite U.S. cities, it could even be my favorite. I felt proud again that I had the initials -SF- tattooed on my right arm.